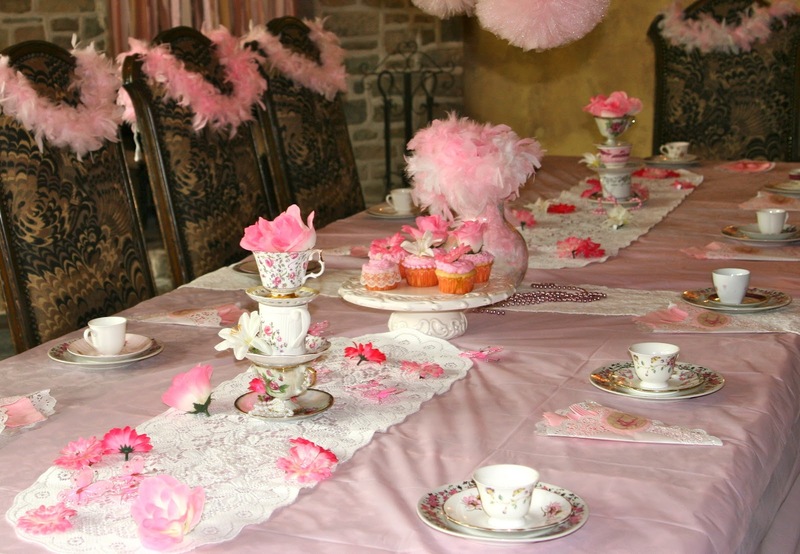 It was my great pleasure to do this Vintage-inspired tea party 2 weeks ago. 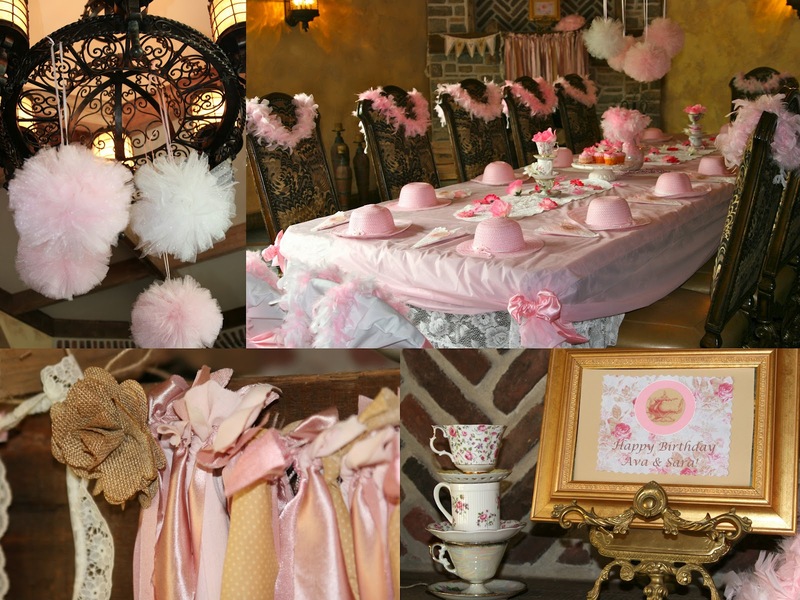 The client wanted a classic tea party to celebrate the birthdays of both of her daughters (just a few weeks apart). I must say, it was one of my favorite parties to design! The room used for the party was gorgeous! A huge, European style finished basement. I knew I had to do something special to work all that pink into the design -without losing all the warmth and wood already in the room. Adding some warm tones – beiges and gold – to the pink gave it a vintage look that worked with the room and at the same time stayed with the theme. I was really happy with the way it turned out. A friend of mine, Susan Harrell, took photos of the set up for me. Thanks, Susan, for doing such a great job! The 1st table set up was for crafting. 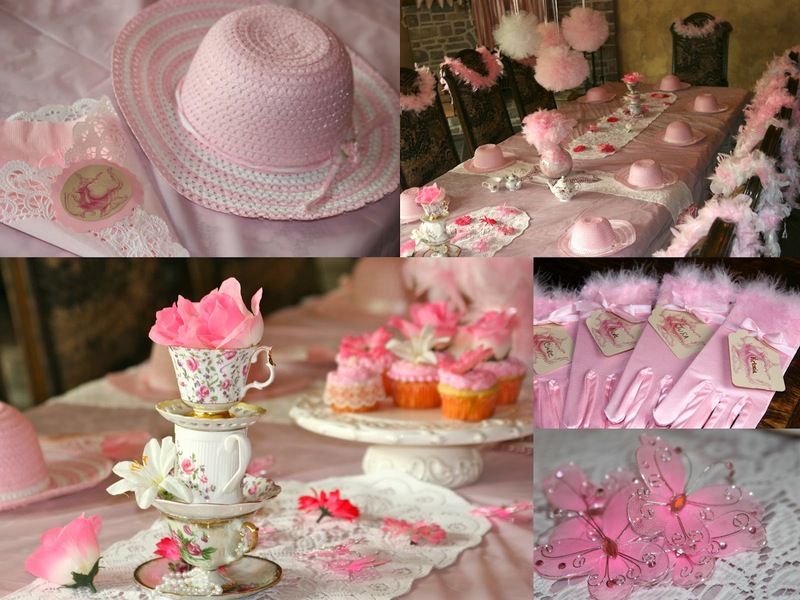 Hats were placed at each table setting instead of a plate. Boas were draped on each chair. The flowers and butterflies to decorate the hats were scattered in front of them on the table. Boas were also used to make fabulously fluffy tea hats. Fun! An additional craft was done next. 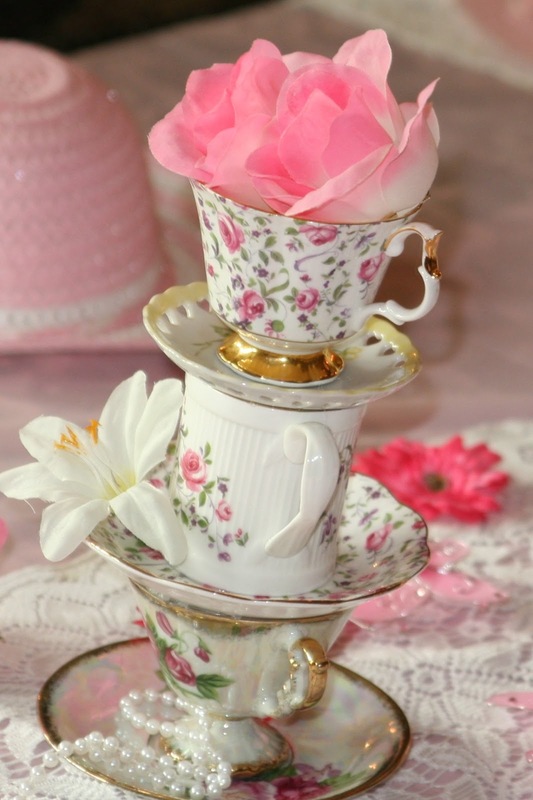 Hand painted, wooden tea cups and pots (in shades of pink) were passed around, along with lots of gems for decorating them. Later, the set up changed to tea service…including real china cups, saucers, and plates I’ve been collecting just for such an occasion. The girls sipped pink fruit tea with cake. The fun is in the details! 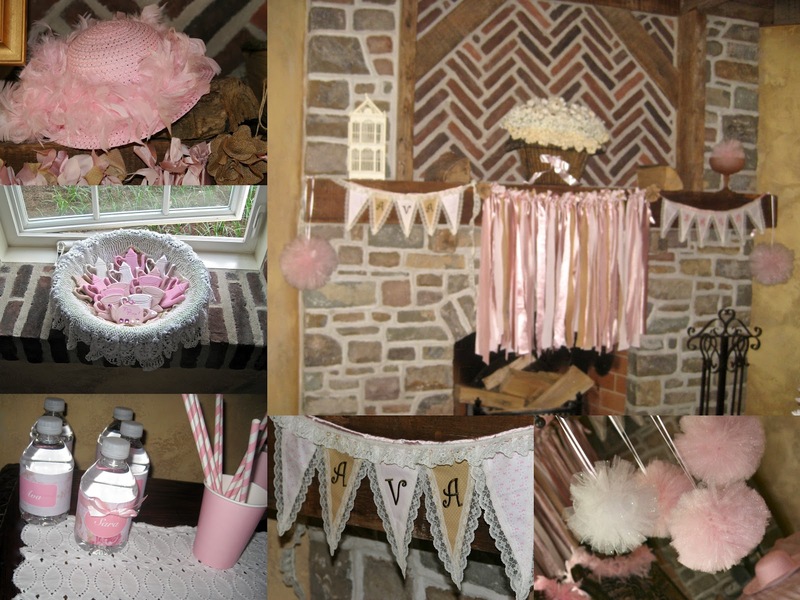 Tulle pom poms, pearls, personalized bunting, flower cup cakes, custom water bottles, pink striped paper straws and feathers all made for a pretty mix. 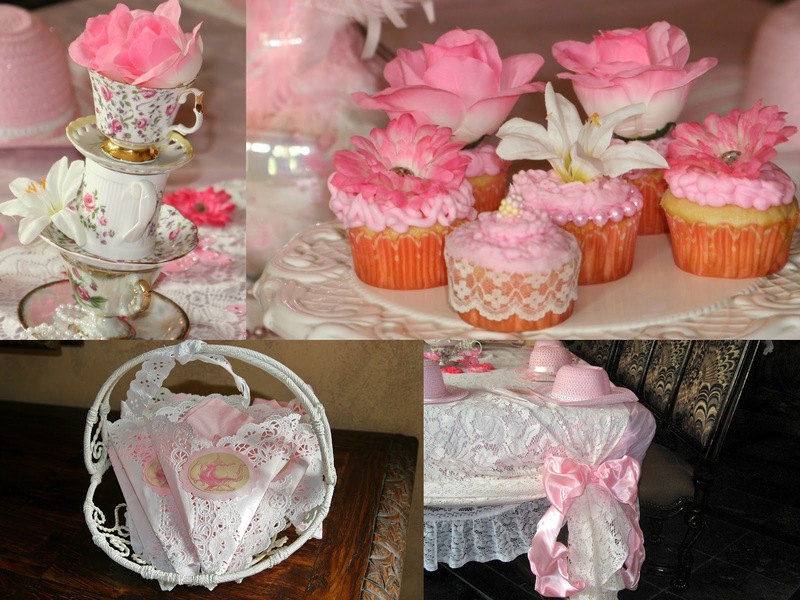 Tea cup towers, vintage inspired “blooming” cupcake display, lace tablecloths, and hand made napkin holders were a lot of fun to make! (See doily napkin holder tutorial in one of the posts below). And now…a few pics I took the day of the party. Forgive the quality of the photos! Nail painting station. Added a dozen roses and brought a lamp from home to complete the look. Don’t like the look of those plastic table cloths? BUT, you still need to protect a nice table from polish or crafts? Just add lace underneath and tie up a few sections with pretty ribbon or lace! Had to end the post with a nice shot Susan took. Hope you enjoyed seeing this party! 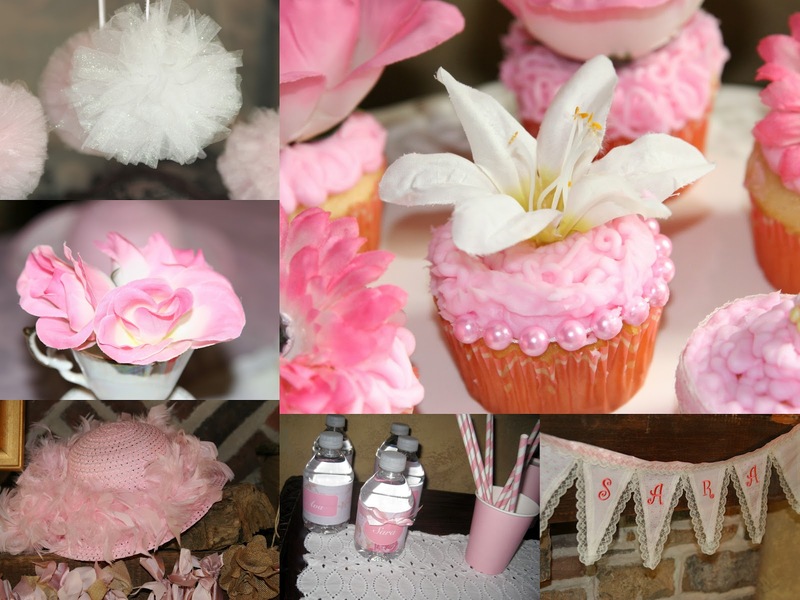 Party styling & design: PLAN ME A PARTY!